The objective here is to send a bullet to where the target will be. So in essence, the target places itself in front of an oncoming bullet! It is like football. The quarter back does not trow the ball at the receiver. He trows it where he hopes the receiver will be by the time the ball gets there. For now, let's assume the wind is null. Target direction can be judged by simple observation. All calculations here will be done for a target moving at a 90° angle. If the target moves at a 45° angle, use 1/2 the calculated value. For target range, use the mildot, laser range finder, or any other method. 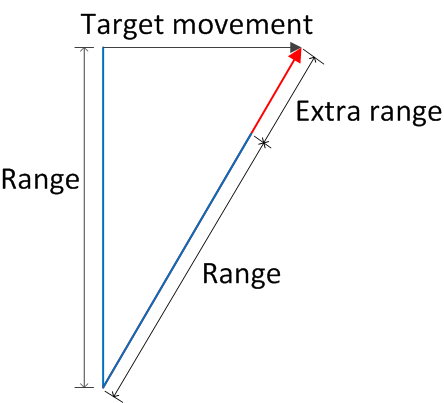 Math or physics inclined readers might object that range will vary as the target moves. And they would be right! However this theoretical variation is very small in practice. I calculated the differences for targets moving at 3 mph, 6 mph and 10 mph, for ranges from 100 to 1000 yards. See this pdf file for the results. Even if you let the target move for 1 minute before sending it, the range difference is below 1 yard for almost all distances. For the worst case, 100 yards range with a target moving at 10 mph for 1 minutes, the range variation is 2.95 yards. Three yards out of 100 will not make you miss the target. So calculate your range as you would normaly do and do not wait to long before sending it. I will show you a method for calculating an exact value. Time can be measured with a simple stop watch or chronometer. The distance can be evaluated quite simply with a mildot scope. When the target crosses a point of your reticule, call "GO". Your spotter starts his chronometer. 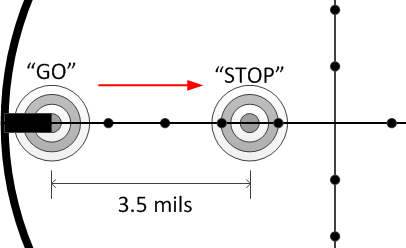 When the target has moved a certain number of mils in you scope, call "STOP". The spotter stops his chronometer and notes the time it took. Note: the size of 1 mil at target range is usually known in inches, so divide by 12 to get it in feet. Distance in mils: 5 mils. The bullet speeds are published by the manufacturer.